"Birthday Bee Bop," and learn how to do the "Birthday Limbo." Children will also enjoy traditional games like "Duck, Duck, Goose" and "Simon Says" set to NEW original music. Hours and hours of pure fun and entertainment. Also includes a full color poster featuring "Pin The Bow On The Birthday Bear" game! 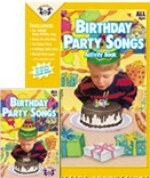 The 24-page book also includes activities for making birthday hats, cooperation games, and rainy day games.